Since I really enjoyed the Red Velvet Cake Batter Dessert Hummus I made last week, I decided to make something else red velvet as well. Because, why not? Valentine's Day is just a few short days away so it will be festive, and I always love popcorn. 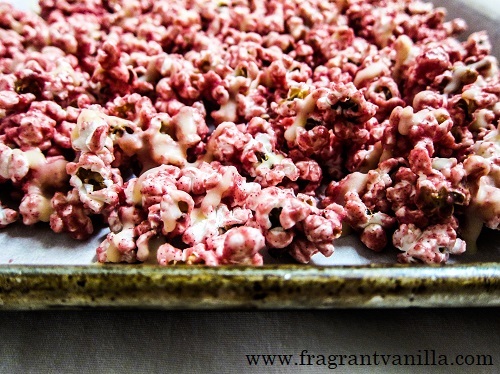 It is kind of surprising that I have never made red velvet popcorn before. 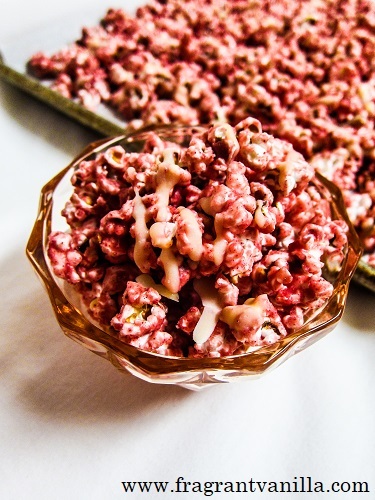 I have made many other sweet dessert popcorn recipes. Like berries and cream, chocolate mint, and turtle. 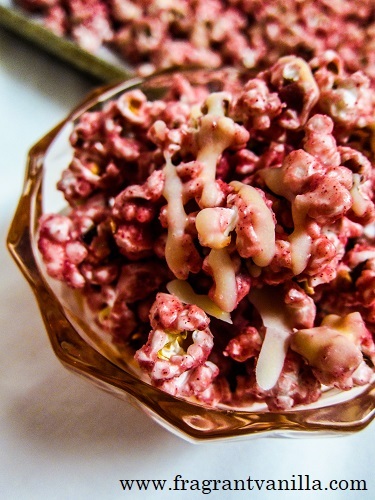 I pretty much love using the flavors found in classic desserts in popcorn. I first got the idea when I was at a Mall on vacation when I was visiting New Orleans, and I came across a popcorn shop. They must have had hundreds of flavors in there. Pretty much anything you can think of savory and sweet. I figured most of it wasn't vegan and if it was, there was probably lots of refined sugar in it, so I just went in there to admire the flavors and maybe get ideas for making some at home. One of the flavors that I saw was red velvet cake. So, I thought to myself, I need to make that some day. Well, it kind of got pushed to the back of my mind I guess, because I didn't remember that I wanted to make it until this week. And, that was over a year ago. I guess I had to be in the right mood too. Any excuse in February to make things that are pink and red and hearts for Valentine's Day I am on it. Of course this doesn't have hearts but it is pinkish red so I have that covered. Also, I figured I could share it with Eric, because if I don't share my snacks with him, he will go out and buy even more unhealthy ones. Also, he has a huge sweet tooth as well. 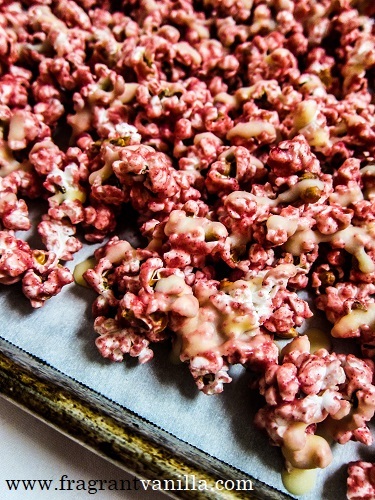 This is pretty easy to make if you have plain popcorn on hand. I like to just make mine in the Whirly Pop with coconut oil, because it turns out perfect every time. But you could also just buy it. If it already has salt in it though, just omit the sea salt from the coating in the recipe. The red velvet coating is so delicious! It has only 6 ingredients including sea salt, and it is colored naturally. I don't bring artificial food coloring anywhere near my food anymore. I actually used beet powder in this, which is my go-to red or pink food coloring. It doesn't end up a bright red, but more of a pink red. I am ok with that though. You can usually find it at your local health food store in the bulk section. I get it at my work, Fresh and Natural Foods. 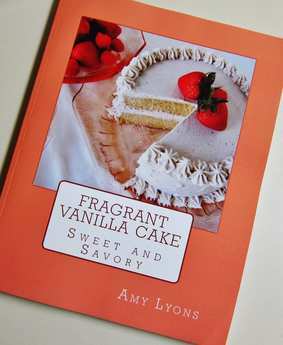 The coating tasted like vanilla cake batter and that brilliant red, pink color was beautiful! But I decided to make it a little more over the top and add a white chocolate drizzle since I had some white chocolate on hand already. If you don't want to do this extra step, I totally understand, and it will still taste amazing. It just won't have white chocolate. I also figured red velvet cake has frosting usually so the white chocolate drizzle is sort of the frosting. Once the popcorn is all done it is so good! Trust me, I ate half the pan before I knew it. You will keep going back for seconds. And thirds. Lucky I had to save some for Eric or I might have eaten more. 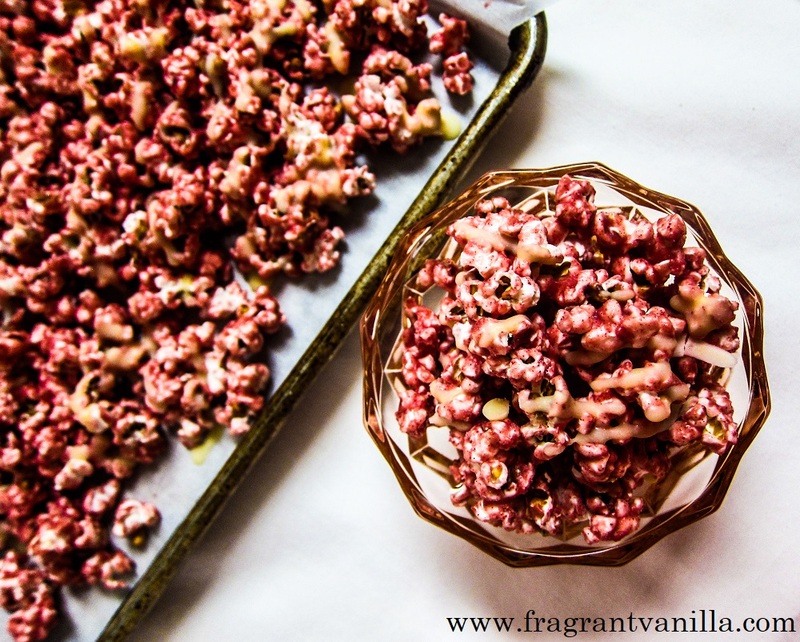 If you are looking for a sweet and crunchy snack, give this a try! In a glass measuring cup (or bowl) whisk together the maple syrup, coconut butter, cashew butter, sea salt and vanilla until well blended. Pour over the popcorn in a large bowl, along with berries and mix well. 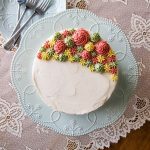 Spread out onto a lined sheet pan, and place in the freezer until it is hard. 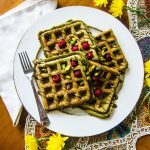 Combine cacao butter, cashew butter, vanilla, maple syrup, and sea salt over a double boiler, and whisk until smooth. 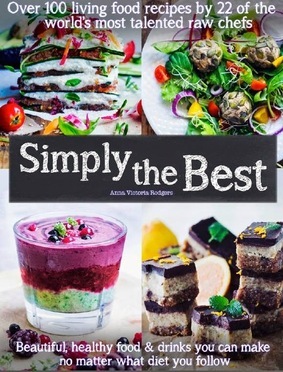 It is now ready to use in the above recipe. Or, if you just want to make white chocolates, pour into a chocolate mold, and place in the freezer until set. Store white chocolate in the refrigerator. Read the directions, it is in there with the rest of the wet ingredients :).